The Globe Star Engineers, Gujarat, India manufacture, supply and export the Stationary Ring for the water and oil. It is specially designed to protect the shaft. 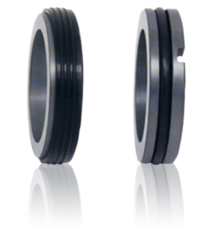 We offer the U74 series of the rubber bellow seals. The seals are rotating to bellows. The rubber bellow seals can be customized as per client’s specification and requirement.The rubber bellows seals are used in water pumps, submersible pumps and sewage pumps.